In the last few days, we have seen numerous reports detailing the state of the smartphone market across countries. This was led by none other than Kantar Worldpanel, which listed the smartphone market share trends in 7 different countries. Apart from this, we also had reports from Neilsen, Analysys, Needham & Co., MTS & IDC. 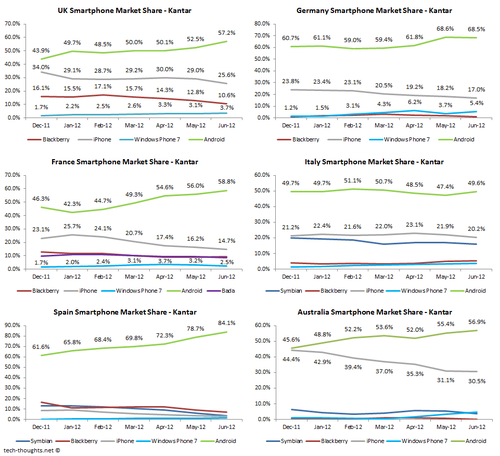 Let's take a look at the country-wise market share trends from most research reports published so far in 2012 and take a look at the smartphone competition between the Android, iPhone and Windows Phone platforms. Over the last couple of years, we've seen a clean transition from Nokia's market leadership. Symbian's leadership position was taken over by Android, while the iPhone replaced the Blackberry platform as the de facto #2. The interesting part is the much hyped race for the "third platform". In 2009, Microsoft's Windows Mobile OS had the undisputed position as the #3 platform in the market, behind Symbian and Blackberry. Unfortunately, during this change of guard, Microsoft has been struggling to gain relevance with it's new Windows Phone platform. It has been 7 quarters since the release of Windows Phone and the platform's market share is still languishing below 2% (including Windows Mobile's market share). In stark contrast, the iPhone and Android had garnered market shares of nearly 17% and 26% respectively, during the same post-launch time frame. Let's start with the country everyone seems to be obsessed with right now. According to Canalys, China recently overtook the US as the world's largest smartphone market. A Chinese research firm called Analysys International has been tracking market share figures in the country for the past few quarters. 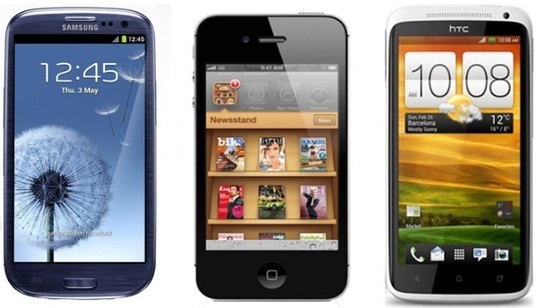 According to figures from Analysys, Android has replaced Symbian as the leading smartphone platform in China. The iPhone has seen incremental growth for the last few quarters as well, but Microsoft seems to be struggling. These figures seem to pour cold water on Microsoft's claims of overtaking the iPhone's market share in China. Equity research firm, Needham & Co. has also released their estimates for China's smartphone market. While Android's market share figures aren't too different, they claim that the iPhone has overtaken Symbian to get to the #2 spot in China. The estimates may not necessarily agree with the figures, but the trend is unmistakable. Android leads the market, Symbian is dying, the iPhone is growing and Windows Phone & Blackberry are nowhere to be found. Both firms track quarterly smartphone sales, but Neilsen's data is reported every quarter while Kantar's data is reported every month. Again, while the numbers differ, the trend is unmistakable. The strength of the Android and iPhone platforms in the US market is unparalleled, while the demise of Blackberry and the struggles of Windows Phone are clear. Nokia has always struggled to gain a foothold in the US market and Symbian is practically non-existent. Interestingly, the US is the only market where the competition between Android and Apple is this fierce, whereas Android has established itself as the clear cut #1 platform in other markets. Apart from the US being an Apple stronghold of sorts, this is also created by artificially low pricing for the iPhone thanks to high carrier subsidies. I have written before about how carrier subsidies pose a huge risk for the iPhone. Well, that's not much of a surprise, is it? The Android platform (in green in the charts above) is absolutely dominant in Germany & Spain and is expanding its dominance in UK, France & Australia. In Italy, the smartphone market share trends this year seem to be in a holding pattern. In fact, Italy seems to be the only market where Symbian has a meaningful presence remaining. The iPhone has solidified its position as the second largest platform, but seems to be losing further ground to Android in all markets, except Italy. And as usual, Windows Phone is scraping the bottom of the barrel. The only regions where Windows Phone seems to be relevant is in Germany & Australia. 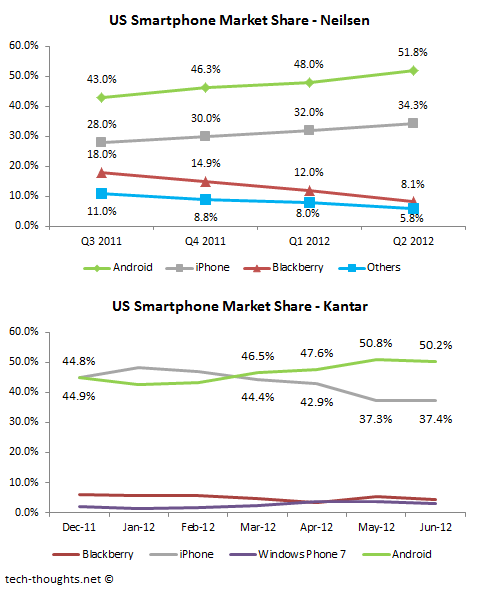 In fact, Germany is the only region in Kantar's data, where Windows Phone's market share seems to crack the 5% figure. Israel's smartphone market seems to mirror most of the world with Android in the lead and the iPhone second. Windows Phone was quoted as having "only a negligible market share today". 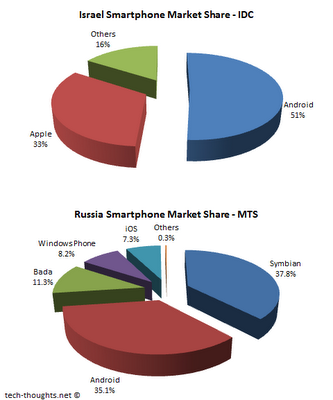 MTS's figures in the meanwhile still show Symbian in the lead, with Android a close second. Samsung's Bada OS, in third, is the only other platform with a double digit market share. Interestingly, MTS' sales show Windows Phone leading the iPhone by nearly 1%. While Israel seems to follow global trends, the Russian market seems to be a market that's still in transition, much like the Indian smartphone market. This could be a reflection of the price sensitivity of the market, with lower influence of local manufacturers. This would also explain Symbian still controlling 38% of the market. The platforms with single digit or near single digit market share also still seem to be in limbo, considering the fact that an OS as obscure as Bada has an 11% market share. Of course, this could just be the case of MTS' data not being representative of the rest of the market. In any case, I would expect industry trends to move closer to the global paradigm within a year. Conclusion - The smartphone market share trends compiled here, from numerous sources, all seem to point to the fact that Android will be the market leader going forward, with the iPhone as a strong #2 player (except in extremely price sensitive markets). Symbian & Blackberry seem to be dying out in terms of consumer mindshare and Windows Phone is struggling to become the third platform. Even with the release of Windows Phone 8, it is difficult to see the platform gaining too much headway at this point. If Microsoft isn't able to mount a serious push to become relevant as a third platform by 2013, it may open the door to competition from Firefox's HTML based smartphone OS. Stealing the spot for #1 you mean.